The Mercedes-Benz S Class represents the commitment to build the best car in the world, so you can’t accuse the German automaker of having low ambitions. Then again, with more than four million sales of the “Sonderklasse” – or “Special Class” – and its variants under its belt since 1972, it seems there’s a market out there for obsessive attention to detail and a price tag to match. That makes the 2018 S Class line-up not only important to Mercedes-Benz, but to the industry as a whole. You might wonder why, though, Mercedes invited me to New York to drive the newest models. There are a few good reasons for that, actually. From 1957 to 2012, Mercedes-Benz was on display at the theatrical auto showroom designed by Frank Lloyd Wright at 430 Park Avenue at 56th Street. Now, New York has one or the most significant Mercedes dealerships in the United States, which covers 330,000 sq.ft. Most crucially, over the last few years, 20-percent of all US sales of the S Class have been in the Tri-State area. In short, New York is an essential market, and one the new car needs to get right. The US will receive eight S Class variants in total. 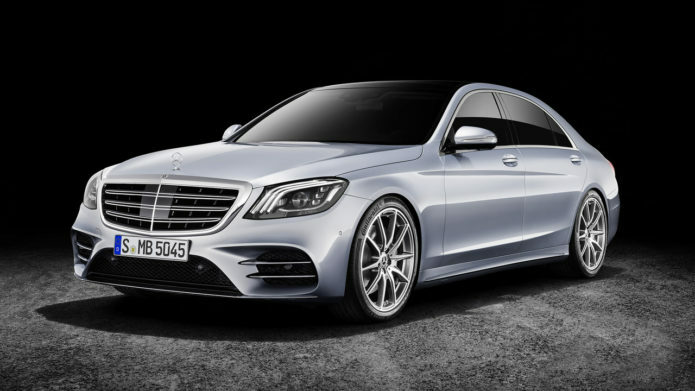 The “entry level” are the the S450 and S450 4Matic, each with a 362-horsepower twin-turbo 3.0-liter V6 and 9G-TRONIC automatic transmission. Next come the S560 and S560 4Matic, powered by the 4.0-liter twin-turbo V8 which is a detuned version of the engine found in the S 63 AMG. Under that hood, it’s paired with Mercedes’ new AMG Speedshift MCT 9-speed sports transmission, too. The new twin-turbo engine is one of the most economical V8 engines in the world, Mercedes says, consuming 10-percent less fuel than its predecessor by deactivating half of its cylinders when under partial load. On the high end, there’s the Mercedes-Maybach version of the S560 4Matic. If you’re still craving a V12, the rear-wheel drive Mercedes-Maybach S650 and S65 AMG will fill that void. The S65 utilizes the AMG Speedshift Plus 7G-TRONIC transmission. Whichever the sedan, the interior features dual 12.3-inch high-resolution LCDs behind one plane of glass, an expanse of screen for both the driver and center displays. The steering wheel features two touch controls on both the left and right spokes, while the cruise control settings have also moved to the wheel, in a departure from the standard control stalk. Inside the center console is a Qi wireless charger for your smartphone, two USB ports, and NFC. As we found when we drove the S63 AMG earlier this year, Mercedes doesn’t stint on comfort. Energizing Comfort Control, for example, offers different combinations of massage, lighting, climate control, and fragrances, which the automaker claims can help you hold up on longer trips. The enhanced ambient cabin lighting allows you to choose from 64 colors in a variety of themes and zones. The new intelligent drive system is one of the most complex currently on sale. It combines steering assistance, Distronic adaptive cruise control, stop assistance, and speed limit assistance. Tap the blinker stalk while everything is active, and the S Class will automatically switch lanes. Part of the system is even designed to help the occupants’ hearing survive a crash: before the impact, an 85-decibel noise is played by the speakers to help prepare your ears for the sound of a collision. Although much of the car is carried over from the 2017 model year, the 2018 S Class features more than 6,500 new parts including new exterior designs, interior, engines, and driver assistance systems. That includes the eye-catching triple torch headlights, while help set the car apart from the rest of the Mercedes line-up. Within the range, the automakers have used several different front designs – including an AMG line exterior – with each variation getting a different lower fascia air intake layout. We started our drive in Manhattan, in the shadow of WTC1. Mercedes wanted us to get a feel for what it was like to live with an S Class every day, and so the S450 navigation sent me off to a favorite Greenwich, Connecticut coffee shop. The first thing I noticed is just how comfortable the seats are, a first impression that developed over the course of the day as I came to appreciate Mercedes’ balance of cushioning and support. With the Energizing Comfort Control set to “vitality” the cabin lighting adjusted, and I activated the seat massager. We pulled the steering column-mounted shifter and headed out of the city towards the Hudson Parkway, the S Class’ air suspension making short shift of the New York asphalt while the cabin insulated us from the outside world. The V6 feels excellent despite this being such a large sedan, and it quickly motivates the car when it was necessary to pass slower traffic. Similarly, the 9-speed transmission never felt wrong-footed when selecting the best gear. Mercedes has even given the V6 a very pleasing engine sound, though you’ll only really hear it when the windows are down. Honestly, the only advantage a V8 might have had would be a quicker 0-60 time and higher status with the more significant number on the trunk lid. An hour drive to Greenwich passed quickly behind the wheel, and I’m not sure if I should credit the Energizing Comfort Control or the underlying engineering for how relaxed I felt, despite having been sitting gin traffic. That’s important, too, since though the S Class is often viewed as a vehicle to be driven in, the driver gets looked after just as well as those in the rear seats. Meanwhile, the technology in the center stack certainly has a learning curve, though that’s the status-quo for everything in the segment. As more complexity and functions are added, it takes time to figure out all the various menus and options. After a stop for coffee and some pastries – something I’m told S Class owners do, so felt only right for partaking in – it was time to switch to the Mercedes-Maybach S560 4Matic. My co-driver got comfortable in the Delta One-equivalent back seat, and I set the mood with a little Teflon Don. Then, we set off from the coffee shop to our lunch destination in another Connecticut suburb. It’s a route that would take us through the neighborhoods of your typical Connecticut S Class owner. More so than the standard S Class, the Mercedes-Maybach focuses its talents on those in the back seats. Still, driving the Maybach is something else, not least because you just feel incredibly isolated from the rest of the world. The Delta One comparison is particularly apt: you really might as well be flying first class. The Maybach’s adaptive damping works in conjunction with the Airmatic suspension, optimizing ride and handling by automatically tweaking the damping profile for each spring-strut whenever that wheel changes its vertical direction: whatever seat you find yourself in, all you need to know is that it’s almost astonishing how well this car smooths out road imperfections. On the Hutchinson Parkway, I switched on the new Intelligent Drive system and let the car gods take the wheel. Mercedes has built in a sea of sensors to help navigate the busiest roads, and though you can’t take your hands off the wheel for very long, it’s still possible for short bursts. The car steered us as expected, except for when the road markings were either interrupted or completely absent. Still, road marking conditions is not something any manufacturer can control, and the engineers have err’d on the side of caution. The Tri-State isn’t all big city driving, of course, and so we ended up on some surprisingly rural roads punctuated by sleepy Connecticut suburbs. The Maybach felt just as great on these slow meandering roads as it did on the fast-paced Hutchinson Parkway. The whole time my passenger was riding in the highest of luxury and closing some of the largest business deals of the day, or so he claimed. I suspect actual owners would be able to put the reclining rear seat and folding table to more productive use. After lunch, we switched into the mighty S 65 AMG for the final leg of our drive, concluding in Long Island City. Don’t let the size of the S 65 fool you. Of the three cars that I drove, this is the athlete of the bunch, and it has my favorite exterior design, too. The AMG engineers won’t just put the AMG badge on any car: the hand-built 612 horsepower 6.0-liter V12 is good for a 0-62 mph time of just 4.2 seconds, while the 16.5-inch AMG Carbon Ceramic Brakes can stop the car just as quickly as it accelerates. To demonstrate just how good it can be, Mercedes used it as an F1 pace car, where it did three seasons without rotor and pad replacement. It’s not just raw power, mind: the ingenious AMG Active Sport Suspension keeps the car well-planted whether you’re on the street or the track. It’s called “Magic Body Control” and it sees the S 65 outfitted with a camera that looks at the road surface ahead, detecting upcoming bumps and adapting the suspension to suit. The AMG-specific elastokinematics deliver more feedback to the driver during spirited driving, meanwhile, working in tandem with AMG Active Sport Suspension that has curve-tilting to lean the car into turns like an Acela, helping reduce lateral forces on the occupants. Mercedes is not shy about talking up the track prowess of this car. Of the three instrument cluster display options, one of them is AMG specific with extra performance metrics. There are three AMG Dynamic modes – Comfort, Sport, and Sport+ – while the standard S Class steering wheel is thrown out in favor of the AMG Performance version. Tech takes a step up, too, with the AMG Track Pace app for iPhone integrating with the infotainment system and giving post-lap data analysis along with the ability to share particularly good results through social media. If you have a GoPro camera, you can connect that too to have video recordings of your performance merged with speed, acceleration, and lap and sector times. In the more mundane setting of the real world, the S 65 accelerates effortlessly onto the highway and overtakes even easier. This was by far my favorite car of the day: the feel of the V12’s torque is, frankly, addictive, and the car will accelerate into the “go directly to jail” zone without any effort whatsoever. While it may not have the luxurious back seats of the Maybach, or the extra legroom, this would certainly be my choice were I in the market for an S Class. Apparently that’s not a decision most owners have a make, however: the average S Class owner, the automaker tells me, keeps more than one in their garage. If they’ll accept my advice, I’d suggest making sure at least one of those cars is an S 65. It’s rare that I – or indeed most of us – am able to experience a car like the S Class. There’s a reason why this car is so popular in the Tri-State area, not least in that it’s a rolling status symbol at the highest level. Yet to reduce it to badge-bragging is to ignore what really makes the S Class so successful – and that success so enduring. The S Class and its variants are some of the most capable cars on the road today. The size is deceptive: they’re athletic to go with their deep vein of technology. Much of that tech will eventually find its way into Mercedes’ more affordable models, too, having proved its worth among a seriously discriminating audience. Times, though, have changed since the early days of the S Class. Mercedes’ finest now faces competition not only from its domestic rivals, such as the Audi A8 and BMW 7 Series, but new riffs on the luxury segment, such as the Range Rover SVAutobiography Long Wheelbase. What keeps S Class buyers returning, though, is just as much about brand loyalty as it is technology and cosseting. For the rest of us, it’s the trickle-down of refinement that we have to look forward to. I may not be able to afford an S Class today, but there’s a fair chance I’ll be benefiting tomorrow from the technologies that make their debut in it.